Group Visits at Dewstow Gardens and Grottoes01291 431020work Group VisitsImagine discovering a lost garden with tunnels and underground grottoes buried under thousands of tonnes of soil for over 50 years. That’s what happened at Dewstow Gardens & Grottoes. Built around 1895, the gardens were buried just after World War Two and rediscovered in 2000. The gardens contain many ponds and rills, but interestingly a labyrinth of underground grottoes, tunnels and sunken ferneries. Groups must be pre-booked, group bookings (10 minimum) can be arranged on most dates, and are charged at the concessionary rate of £6.00 per person. We do not offer guided tours at Dewstow. We recommend a minimum of 2 hours to visit the garden; however, most groups stay much longer than this. It is our policy to meet and welcome all visiting groups on arrival. Your coach driver will be offered refreshments, and both driver and courier may enter the gardens free of charge. To find out more details, speak to a member of our team today. We have a reception area and tea/coffee room at the gardens serving hot and cold drinks, snacks and light meals during the day until 3.00 pm. Imagine discovering a lost garden with tunnels and underground grottoes buried under thousands of tonnes of soil for over 50 years. That’s what happened at Dewstow Gardens & Grottoes. Built around 1895, the gardens were buried just after World War Two and rediscovered in 2000. 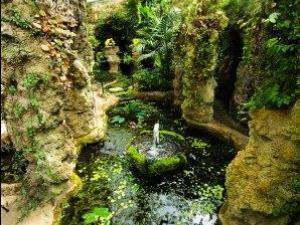 The gardens contain many ponds and rills, but interestingly a labyrinth of underground grottoes, tunnels and sunken ferneries.